“I didn’t think that I would like any zombie game more than Dying Light. However, my time spent with the game shows you can make a good zombie game when the game puts you, the player, in the shoes of a non-soldier character. The first time I played the game, I was under the impression that I would be a soldier looking to help the populace. The more I learned about the game, I more I realized I was simply an aide worker dropped into a hot zone for unexplained reasons from a relief agency other than to retrieve a file important enough to risk infection and becoming a zombie. As a result, I was helpless from the get-go and the only option I had was to run and parkour until I find weapons, which kept zombies off for a while, but not enough. Eventually, I would have to fight better, find stronger weapons, and become more agile to take on the undead and survive in this zombie-infested universe. For me, there were plenty of highlights in this game: moving nearly seamlessly through Haran by running and parkouring, finding weapons, crafting new items, and combat against not only zombies, but bandits who try to steal care packages meant for the people. Taking control of the environment and eventually becoming powerful enough to stave off the hordes was really satisfying. At night, the environment gets tougher as I run away from the Volatiles to live another day. The Volatiles easily made up the more interesting enemies in the game. Stealth is totally key to ensure survival. Otherwise, the best chance would be to find other players to support the mission and fight them off for high XP. Unfortunately, not all is well with this game. The weakest part of the game is the narrative. The story is something we’ve heard many times over with nothing new to offer. The main antagonist is simply full of clichés with no real meat to his bones: what motivated the villain to become the monster we have to contend with. The villain is derivative of many villains we’ve already beaten in various games of many genres: first-person games, zombie games, adventure games, etc. The story feels like it is playing tug-of-war with deciding between over-the-top silly and dramatic. This to me was the most disappointing aspect of the game. Easily the side quests and activities make up the interesting parts of the game. I never really got bored of running for air drops, eliminating the bad guys, and knowing the people who still hang out in Haran. The NPCs for the most part are humorous and interesting to learn about. Otherwise, the narrative would run the same way as before over and over again. You can climb and parkour your way through the city to fight or avoid zombies. Night time is a scary time to be out. Zombies have more acute senses and do more damage. 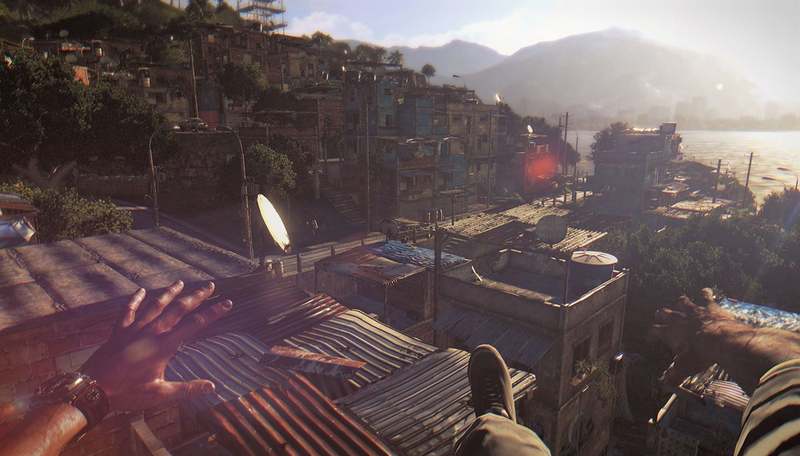 “I am happily surprised with how much I’m enjoying my time with Dying Light. Although I haven’t found myself fully immersed in the main story line, I love side questing. The strange and sometimes humorous nature of these missions really grab me – that’s probably why it’s taking me so long to actually complete the game, haha! The challenge missions that require players to do various timed actions such as parkour their way through check points, or slay x amount of zombies with a special provided weapon, are such an addicting aspect of the game, too. Every time I see one pop up on the map everything else is pretty much on hold. Coupled with co-op, these really bring out the competitive nature out in me, too, since even though you and your buddies are working together, the game still keeps track of individual scores. Speaking of co-op, once I made my way past the earlier portion of Dying Light, I decided to invite some friends into my game, and it was AWESOME. Co-op definitely puts more power in the hands of players, and we felt (almost) invincible as we wrecked hordes of zombies during the day and farmed experience at night. Loot is also personal (think Diablo III-esque), so there’s less fussing about picking things up and inventory management. I haven’t encountered any major issues with the game. One of the funnier “problems” I noticed early on occurred when a Brute attempted to chase me into a building. His poor character model is just a little too big for most doors. Poor guy. I can’t think of anything I would change in the game, but with modding being introduced to Dying Light, I’m certainly excited to see what others will think of. The first time I started playing around with weapon mods, I was like: “OH MY GAHD. I have a freaking gas line running up my bat, I’m crushing skulls, AND lighting them on fire!? This is too cool.” Weapon mods have the ability to turn some of the most mundane looking objects into badass weaponry and I just love that. I think if you’re looking for a fun experience to share with your friends that is not so much focused on survival and more about tearing through hordes of enemies and questing, this is a solid choice. Riot geared zombie vs our makeshift weapon, go! Thank you, everyone, for taking the time to review Dying Light. This game was developed by Techland and released on January 27, 2015. It is available for PC, PS4 and Xbox One. If you want to stay updated on more Gamer Compatible reviews, you can follow us on Twitter: @gamercompatible or on Facebook: @gamercompatible. All images were taken from Dying Light’s website. This entry was posted in Reviews and tagged action, dying light, game, gaming, infected, insights, packed, safe zones, supplies, survival, weapons, zombie. Bookmark the permalink.